Particularly for the organization of major events, as sport events, shareholders meetings or Open Air Festivals a huge amount of material and personnel has to be coordinated. 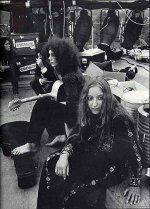 It is not surprising that a professional approach took place in this business since Woodstock. A specialist in hiring stage-hands and crews out to event organisations is Stage-Hands Universal (SU). 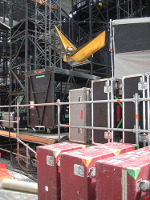 Stage-hands build Stages, help at Theatres, set up instruments or rebuild the stage in a concert pause, know the schedules and have a consolidated knowledge of the different technical equipment on stages. Furthermore they are flexible, do not fear high, like to work at night and they do not care about rain and cold - Sort of living Swiss Army knives. During summer SU coordinates about 800 temporary employees. E-mails can be forwarded to the employees - no more annoying dispatch of operation schedules. An SMS reaches the recipient and can be reread. The hands know they are always up to date. It's easy to reach a whole group. SMS are fast, reliable and unambiguous. 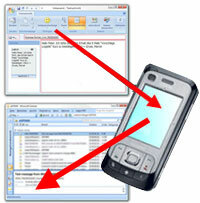 The coordinator stores mobile numbers of the hands in the Microsoft Outlook 2007 address book. Additionally he holds groups by various criteria. In January a thousand plus SMS have been sent to all the temporary employees from the last years. They have been asked to sign in at the SU Webpage if they were interested to get jobs this summer. They could also specify date and area they would like to work. With this information SU was able to roughly plan the coming open air season. The contact information of the hands were grouped by jobs and those groups were forwarded to the project managers (which can easily be done with Outlook 2007). The project managers took over detail planning and the lead at the event itself. Eric is in his temporary office at one of Europe's biggest Open Air Festivals. His Crew consisting of 120 hands will be in charge for the 4 stages and 50 bands and their equipment. Eric is linked with his stage managers via radio. Radio message: Eric this is Mickey, can you send eight to ten strong guys to my stage in ten minutes. A truck can't get to the stage 'cause of the mud. Answer: No problem. Ten persons in ten minutes. Eric sends a message to the stand-by group, whose members stay somewhere behind the stages. Thank to his grouped Outlook Contacts this takes only some seconds. SMS-OUT: Emergency! Unloading a Truck. 21:35 at the ramp behind stage B. Five minutes later another radio message reaches Eric. Radio message: Eric it's me again Mickey. I've got enough people here now. You can order the others back. Answer: Okey-dokey!SMS-OUT to the same group: Emergency at stage B is solved.Thanks to the AUTOREPLY feature the hands can answer the messages from Eric. The answers are sent to Eric's e-mail inbox. Because it is too loud around the stages to use the phone the AUTOREPLY feature is very popular. SMS-OUT: Louie should have come. I'll look for him..
SMS-OUT: Louie where are you! Alja is waiting to be replaced! SMS-IN: Stage 2 at the emergency! SMS-OUT: Go and replace Alja right now, stage 2 will get along without you. 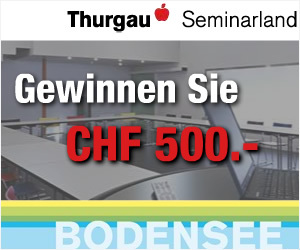 Jetzt an der Verlosung von Thurgau Tourismus teilnehmen:Gewinnen Sie CHF 500.00 f�r eine Tagung im Seminarland Thurgau. �thanks to perfect interaction of planning and communication tools. Because SU is a pan-European company Eric works together with many different stage-hands, who work for several other employers. The crew Eric has set together for the next job in Poland consists solely of polish workers. At the moment they work at different places probably all over Europe. The only reliable connection to them is the mobile phone. Eric wants to send the definitive information about the meeting to his polish colleagues. SMS-OUT: Hi folks! We will meet at 5pm on 8-20-09 on the festival ground next to the broadcast trucks behind the stage for the briefing. After that we will barbecue (SU pays! ).If someone is prevented for any reason please let me know as soon as possible. Because Eric does not want to send this message in the middle of the night he uses the possibility to choose the delivery time. He sets it to 2 pm the next day. 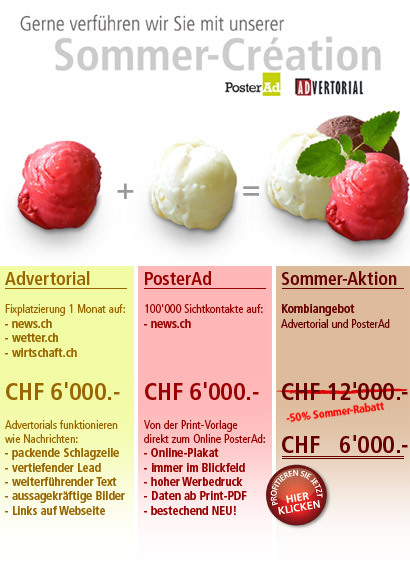 Berechnen Sie jetzt online Offerten f�r eine professionelle �bersetzung nach dem 4-Augen-Prinzip. �ber 20 Sprachen. Nahezu alle Fachgebiete. Lieferzeit innerhalb 6 Stunden.